The first issue of Justin Jordan (DEAD BODY ROAD, the LUTHER STRODE series) and Kyle Strahm’s (HACK/SLASH, HAUNT) SPREAD, the eagerly anticipated new thriller charting the terrifying story of a viral red growth overtaking the planet, has infected readers across the world and has sold out immediately. Image Comics is fast-tracking a second printing of SPREAD #1 to meet customer demand and continued viral enthusiasm for the new series. In SPREAD #1 readers learn that ten years previous, humanity dug too deep and unleashed something ancient that couldn’t be controlled. Something that couldn’t be stopped, twisting everything it touched into more of itself. The Spread. Mankind was nearly destroyed before finding a way to slow the Spread. Now, deep inside the quarantined zone, one man has found what might be the key to stopping it forever: a baby girl. And if he can save her, he might save the world. SPREAD #1 has completely sold out at the distributor level, but may still be available in comic stores. It is currently available digitally on the Image Comics website (imagecomics.com) and the official Image Comics iOS app, as well as on Comixology on the web (comixology.com), iOS, Android, and Google Play. Image Comics is pleased to announce that this second issue will be going back to print to meet customer demand. The second printing of SPREAD #1 (Diamond Code MAY148297) will release on 8/6. 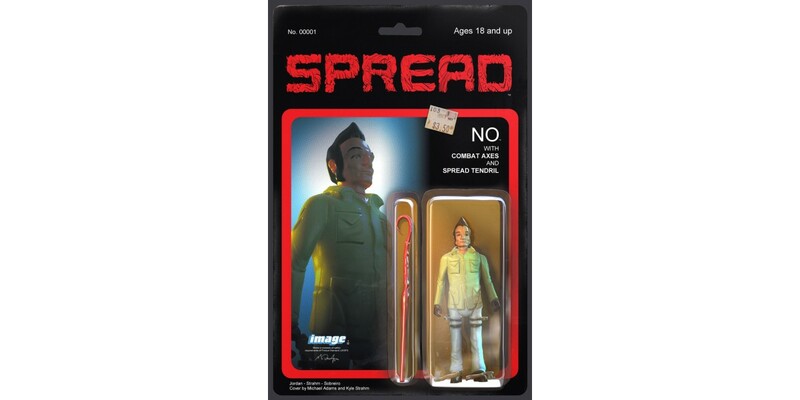 SPREAD #2 will infect stores on 8/6 and can be pre-ordered with Diamond Code JUN140579.